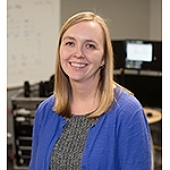 Jennifer L. Collinger, PhD is a Research Biomedical Engineer at the VA R&D Center of Excellence and an Assistant Professor in the Department of Physical Medicine and Rehabilitation at the University of Pittsburgh. Dr. Collinger received her PhD in Bioengineering from the University of Pittsburgh in April 2009. Her doctoral work focused on the prevention of upper limb injuries in manual wheelchair users. Dr. Collinger’s current research interests are related to neurorehabilitation and brain-computer interface technology for individuals with motor impairments.